After the 1957 season, the Brooklyn Dodgers and New York Giants relocated from New York to California to become the Los Angeles Dodgers and San Francisco Giants, respectively, leaving the largest city in the United States with no National League franchise and only one major league team (the American League (AL)'s New York Yankees). 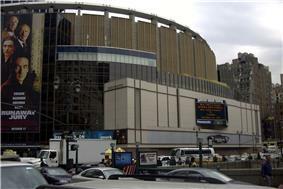 With the threat of a New York team in a third league, the National League expanded, adding the New York Mets. The new team took as its primary colors the blue of the Dodgers and the orange of the Giants (which are also two of the three colors on the New York City flag), and took their name from a 19th-century club, the New York Metropolitans. For the first two years of its existence, the team played its home games at the historic Polo Grounds in Upper Manhattan. In 1964, they moved into newly constructed Shea Stadium in Flushing, Queens, where the Mets played through the 2008 season. 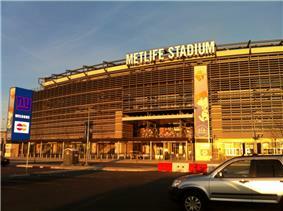 In 2009, the club moved into Citi Field, adjacent to the former Shea Stadium site. During their history, the Mets have won two World Series titles (1969 and 1986), four National League pennants (1969, 1973, 1986, 2000) and five National League East titles (1969, 1973, 1986, 1988, 2006). The Mets also qualified for the postseason as the National League wild card team in 1999 and 2000. The Mets have appeared in four World Series, more than any other expansion team in Major League Baseball history. Their two championships are the most titles among expansion teams, equal to the tallies of the Toronto Blue Jays and Miami Marlins. In 1973, the Mets rallied from 35th place to win the division, despite a record of only 82–79. They shocked the heavily favored Cincinnati Reds "Big Red Machine" in the NLCS and pushed the defending World Series champion Oakland Athletics to a seventh game, but lost the series. Notably, 1973 was the only NL East title between 1970 and 1980 that wasn't won by either the Philadelphia Phillies or the Pittsburgh Pirates. 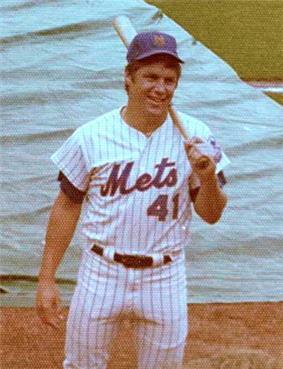 Star pitcher Tom Seaver was traded in 1977, a day remembered as "the Midnight Massacre", and the Mets fell into last place for several years. The franchise turned around in the mid-1980s. During this time the Mets also drafted slugger Darryl Strawberry (#1 in 1980) and 1985 Cy Young Award winner Dwight Gooden (#5 in 1982). In addition, former National League MVP and perennial Gold Glove winner Keith Hernandez was obtained by the Mets in 1983. In 1985, they acquired Hall of Fame catcher Gary Carter from the Montreal Expos and won 98 games, but narrowly missed the playoffs. In 1986, they easily won the division with a record of 108-54, one of the best in National League history. They won a dramatic NLCS in six games over the Houston Astros. The sixth game of the series went sixteen innings long, the longest playoff game in history until 2005. They came within one strike of losing the World Series against the Boston Red Sox before a series of hits and defensive miscues ultimately led to an error by Boston's Bill Buckner which gave the Mets a game 6 victory. They then won Game 7 to win their second World Series title. The Mets continued playing well after 1986 and won the division in 1988, but were eliminated from the playoffs that year and declined into the 1990s. They were out of contention until the 1997 season when they were in wild card contention until the final week of the season. In 1998, the Mets acquired catcher Mike Piazza in a blockbuster trade and missed the postseason by only one game. In 1999, they made the playoffs after a one game playoff but lost the 1999 National League Championship Series to the Atlanta Braves. In 2000, they easily clinched a wild-card spot in the playoffs, and earned a trip to the 2000 World Series against their crosstown rivals, the New York Yankees for a "Subway Series". The Mets were defeated by the Yankees in five games. The Mets had a near playoff miss in 2001 and struggled from 2002-2004. In the aftermath of the 2004 season, the Mets hired a new general manager, Omar Minaya, who immediately turned the franchise around by signing pitcher Pedro Martinez and hiring a new manager, Willie Randolph. The Mets finished 2005 four games over .500, and the franchise's resurgence was complete by 2006 as they won 97 games and the NL East title behind new acquisitions Carlos Beltran and Carlos Delgado, as well as young superstars José Reyes and David Wright. The Mets advanced to game seven of the 2006 NLCS but lost after Yadier Molina’s game-winning two-run home run in the top of the ninth inning. The Mets loaded the bases with two outs in the bottom of the inning, but Adam Wainwright struck out Beltran looking with a devastating curveball. The Mets held a more modest 3.5-game lead after 145 games of the 2008 season, their final season at Shea Stadium. While their 7–10 mark down the stretch was better than the previous season's 5–12, it still allowed the Phillies to pass them once again for the division crown, which they lost by three games. The Mets opened Citi Field in 2009, but were not a factor due to a rash of injuries to numerous key players including Reyes, Carlos Beltran, Carlos Delgado, Oliver Perez and Livan Hernandez. The effect of the injuries plummeted the Mets to a 70–92 record. The Mets improved to a 79-83 in 2010, but still finished in fourth place, missing the playoffs for the fourth straight year. In 2012, Mets owners Fred Wilpon and Saul Katz settled a lawsuit brought against them on behalf of the victims of Bernard Madoff’s Ponzi scheme for $162 million. As a result of this agreement the liquidator, Irving Picard, agreed to drop the charges that Wilpon and Katz blindly went along with the scheme for their personal benefit. Picard had originally sought to recover $1 billion from the Wilpon family and Katz, but settled for $162 million along with the admission that neither the Wilpons nor Katz had any knowledge of the Ponzi scheme. In 2011-2012, Mets ownership sold twelve minority 4% shares (48%) of the franchise at $20 million apiece to provide a cash infusion of $240 million for the team. Despite yet another losing season, the Mets made history in 2011 when closer John Franco and Billy Wagner). Also, Reyes became the first Met in franchise history to win a National League batting title, posting a .337 batting average. In , as the Mets tried to bounce back from three consecutive losing seasons, they lost star shortstop Reyes to free agency, when he signed with the Miami Marlins. The team started out strong, getting a career-year performance from the league's only knuckleballer, R.A. Dickey, and strong production from Wright. But they faltered midseason and ended with a 74-88 record, again finishing fourth in the division. Prior to the 2012 season the Mets had yet to throw a no-hitter, and the franchise's hurlers had gone 8,019 games without pitching one longer than any other major-league franchise. They were one of only two major-league teams to never have a pitcher throw a no-hitter (the other being the San Diego Padres). However on June 1, 2012 Johan Santana pitched a no-hitter against the St. Louis Cardinals. Averting the spotlight from Carlos Beltran's return to Citi Field, Santana turned a routine game into a memorable moment in Mets history. Santana risked being removed from the game after he went over his limit of 110 pitches, placed by the team because of his shoulder surgery. Still Santana stayed in the game and threw 134 total pitches that evening in an 8-0 Mets victory, helped by a few great defensive plays as well as a controversial foul-ball call (coincidentally on Beltran), to pull off the first no-hitter in Mets history. That was the high point of 2012 along with pitcher R.A. Dickey winning the National League Cy Young Award. This would be Dickey's final season as a Mets though as he along with Josh Thole and Mike Nickeas were traded to the Toronto Blue Jays for prospects Travis d'Arnaud, Noah Syndergaard, Wuilmer Becerra, and veteran catcher John Buck. The 2013 season brought another 74-88 finish but they were able to finish in 3rd place. The highlight of the season was sweeping the season series between their cross town rivals Yankees, a first since interleague play started in 1997. Prior to the start of the 2014 season the Mets made a big splash in the free agent market by signing Yankee outfielder Curtis Granderson to a 4 year $60 million contract. They also signed Oakland pitcher Bartolo Colón to a 2 year deal to help offset losing ace pitcher Matt Harvey for the year after he required Tommy John surgery. They would improve to 79-83 and finish the season tied for 2nd place with Atlanta but it was their 6th consecutive season where the finished under .500. Pitcher Jacob deGrom would win the National League Rookie of the Year. Mr. Met is the official mascot of the New York Mets. A fan favorite, he was first introduced on the cover of game programs in 1963, when the Mets were still playing at the Polo Grounds in northern Manhattan. When the Mets moved to Shea Stadium in 1964, fans were introduced to a live costumed version. Mr. Met is believed to have been the first mascot in Major League Baseball to exist in human (as opposed to artistically rendered) form. Mrs. Met (formerly Lady Met) is the female counterpart to Mr. Met. Jerry Koosman wearing his late-1960s' era Mets jersey, which served as an inspiration for the current Mets pinstriped uniform. With the introduction of black as an official color, an alternate team logo was created in 1999. It is identical to the original logo, but the skyline is black instead of blue and the "Mets" script is blue trimmed in orange and white instead of orange trimmed in white (the alternate black jerseys displayed the primary orange and blue logo on the left sleeves in 1998; in 1999 this was changed to the alternate black and blue logo). The logo fell into disuse after the Mets dropped the alternate black jerseys and caps in 2012. On November 16, 2011, the Mets announced new uniforms for their 2012 season, as part of the unveiling of their 50th anniversary plans. The primary change was the removal of black drop shadows from all of the team's jerseys, mirroring the team's original on-field look. The off-white pinstriped jersey, introduced as an alternate in 2010 and based on the team's original 1962-77 home uniform, is the primary home jersey while the plain-white jersey with blue placket and sleeve piping, first introduced in 1997, is now the home alternate. Both uniforms feature the "Mets" script, player numerals and names in blue outlined in orange, and both be worn with the team's traditional blue cap with orange crest (although the orange button on top of the cap has been retained), blue undersleeves, belts and socks. On December 10, 2012, the Mets unveiled an alternate blue fielding cap, featuring an orange brim and a white trim around the orange "NY" insignia. 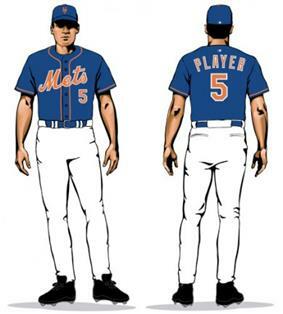 For the 2014 season, a Mr. Met sleeve patch was added to the blue alternate jerseys. On select Monday nights during the 2014 season the Mets will wear camouflage jerseys. These camouflage jerseys are to honor the military, in a "Military Monday theme." The jersey design has the classic Mets script in blue with an orange trim with the number to the bottom left and the jersey itself is camouflage. Tom Seaver is the only Met to win the Sports Illustrated Sportsman of the Year Award in 1969 and was voted the Mets' "Hometown Hero" in a 2006 poll sponsored by DHL. Tom Seaver is the only player to be inducted into the Hall of Fame as a Met and the only player to have his number retired by the Mets. Major League Baseball retired Jackie Robinson's number 42 on April 15, 1997, when the Mets played the Dodgers at Shea Stadium. Butch Huskey wore the number throughout the rest of his Mets career because of a grandfather clause placed on the retired number by MLB. Mo Vaughn also wore number 42 during his stint with the Mets, because of the same clause. #8: Not issued since Gary Carter was elected to the Hall of Fame in 2003. When the Mets honored Carter, they did not retire number 8, but instead gave him a replica of his Hall of Fame plaque depicting him as a Met instead of an Expo. Desi Relaford was the last Mets player to wear No. 8; Matt Galante, a coach, later wore the number. 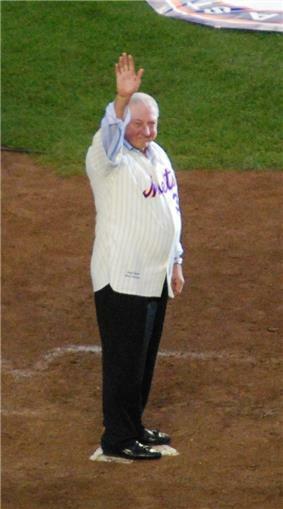 After Carter's death, the Mets honored him in a ceremony on opening day, April 5, 2012. On that occasion the Mets unveiled the "Kid 8" memorial logo (the same one worn on the uniform sleeve) on the outfield fence. However, number 8 is still not officially retired. #17: After being worn by a player nearly every year since leaving the Mets, Keith Hernandez's number 17 was last worn by utility player Fernando Tatis, who played from the Mets from 2008–2010. After years of lobbying by fans to retire the number for Hernandez, it has not been re-issued to any player or coach since 2010. The rivalry between the Mets and the Philadelphia Phillies from 2006 to 2008 was said to be among the "hottest" rivalries in the National League. The two National League East divisional rivals have met each other recently in playoff, division, and Wild Card races. 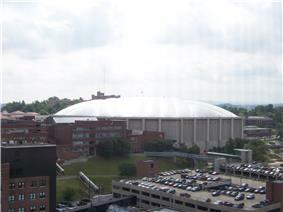 Aside from several brawls in the 1980s, the rivalry remained low-key before the 2006 season, as the teams had seldom been equally good at the same time. Since 2006, the teams have battled for playoff position. The Mets won the division in 2006 and contended in 2007 and 2008, while the Phillies won five consecutive division titles from 2007 to 2011. The Phillies' 2007 Eastern Division Title was won on the last day of the season as the Mets lost a seven-game lead with seventeen games remaining while losing 12 of 18 games that season to the Phillies, including being swept at home in the first 3 games of the remaining 17, dropping their lead from 7 games to 3.5. The Mets – New York Yankees rivalry is the latest incarnation of the Subway Series, the competition between New York City's teams, the American League New York Yankees and the National League Mets. Until Interleague play started, the two teams had only met in exhibition games. Since the inception of interleague play the two teams have met every regular season since 1997, and since 1999 they have met six times each season, playing two three-game series, one in each team's ballpark. From the 2013 season however the number of games was reduced to four, two at each ballpark with the Mets winning six of the last eight games in that span. They have made the postseason in the same year three times: 1999, 2000, and 2006, and faced off in the 2000 World Series. ^ a b "Mets Timeline | Mets.com: History". 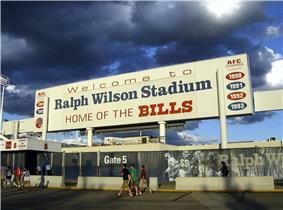 ^ Madden, Bill (June 17, 2007). "The true story of The Midnight Masscare". New York Daily News. Retrieved September 28, 2014. ^ "New York Mets settle with Madoff trustee for $162 million - ESPN New York". ESPN.com. Retrieved October 4, 2014. ^ "Santana pitches first no-hitter in Mets' history". CBS News. Retrieved 2 June 2012. ^ Rubin, Adam (November 16, 2011). "Uniform look – Mets Blog". ESPN. 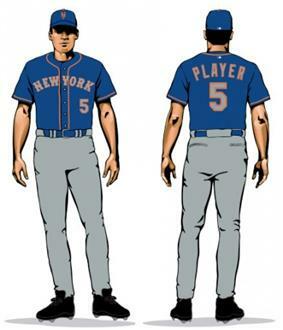 ^ "NY Mets Show Off Two New Blue Alternate Jerseys | Chris Creamer's SportsLogos.Net News and Blog : New Logos and New Uniforms news, photos, and rumours". News.sportslogos.net. Retrieved 2013-01-27. ^ "New York Mets Unveil New Alt Cap at Press Conference | Chris Creamer's SportsLogos.Net News and Blog : New Logos and New Uniforms news, photos, and rumours". News.sportslogos.net. Retrieved 2013-01-27. ^ Chris Creamer (2013-12-20). "Mr. Met added to New York Mets 2014 Uniforms". News.sportslogos.net. Retrieved 2014-04-14. ^ Rubin, Adam (April 21, 2014). "Mets to debut camouflage jerseys". ESPN New York. ^ a b c "Mets by the Numbers". ^ Olson, Lisa (July 8, 2003). "Crazy scene at Shea takes luster off Mets-Braves rivalry". Both Rose and Lewin have other broadcasting duties that conflict with their baseball duties. 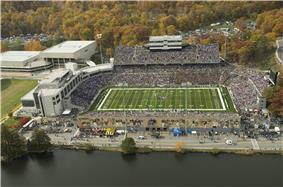 Rose is the television voice of the New York Islanders while Lewin is the radio voice for the San Diego Chargers. In late season NHL games that conflict with Rose's Mets duties, Jiggs McDonald substitutes for him on television most times but Lewin will sometimes man a solo booth. Lewin's duties with the Chargers prevent him from calling weekend games throughout September, and Rose often calls games by himself in his absence. Since 2012, Howie Rose and Josh Lewin have been the radio broadcast team; they share play-by-play and analyst duties. Rose, who has spent much of his career covering the Mets, replaced Bob Murphy as Gary Cohen's partner in 2004 following Murphy's retirement. Lewin joined the broadcast after the team parted ways with Wayne Hagin following the 2011 season. 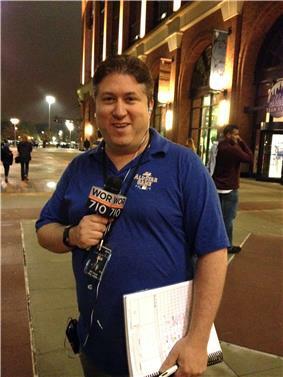 Pregame and postgame shows are hosted by Seth Everett, who worked as a nightly host for WEPN-AM and a sports anchor for both WCBS-AM and WINS before taking the position with the Mets. He replaces Ed Coleman, who decided to remain at WFAN. 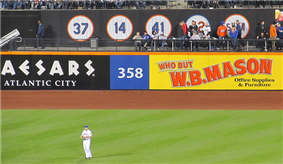 As of 2014, the Mets' radio flagship is WOR. 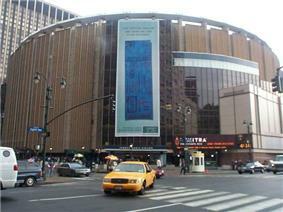 The Mets were previously carried by WFAN, which inherited the team's broadcast rights from WHN when it took over its frequency in 1987, and WFAN-FM, which simulcasts the AM signal. Spanish language broadcasts are carried by WEPN-AM. 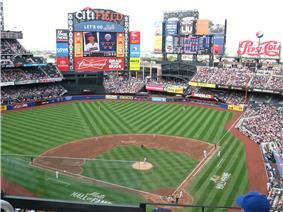 Most Mets games are carried by SportsNet New York (SNY), a joint venture of the Mets and Comcast SportsNet. 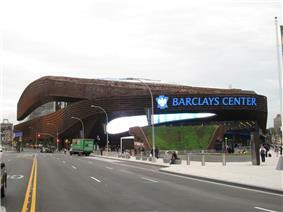 The team's terrestrial broadcast home is WPIX, where the team has broadcast games since 1999.